It’s not too long ago that the vast majority of photographs were taken using 35mm film. Since the advent of digital photography, technical and cost limitations have meant that full-frame sensors, those that are the same size as a 35mm film frame, have been restricted to a few high-end SLRs, rangefinders and compact system cameras, and until now just two compact cameras – the Sony RX1 and Sony RX1R. Now these rare beasts are joined by the Leica Q. The advantage of a full-frame sensor is usually improved image quality, specifically noise control and dynamic range, brought by the ability to make the photoreceptors on the sensor a little bigger than on their APS-C and Four Thirds format counterparts. They also make it easier to restrict depth of field to separate subjects from their background and add creative blur. Of course there’s a downside too. Often most notably, full-frame cameras tend to be much more expensive than smaller format models because the sensor is usually the most expensive component. As well as taking up more space, the large sensor also requires a bigger lens to produce a large enough image circle and naturally this adds up to making the camera larger – although manufacturers, most notably Sony, are managing to shrink cameras all the time. Despite their high price, Sony’s RX1 and RX1R have been quite popular amongst professional photographers who want a compact camera that delivers top-notch results. The new Leica Q looks set to entice a similar audience as well as well-heeled enthusiasts with a love of photographic traditions. We were sent a full production sample Q before its launch, so we’ve been able to put it through its paces for this review. Leica has a long history and a reputation for making high quality cameras and lenses along traditional lines. A working agreement with Panasonic means that some of Leica’s compact cameras are made in Panasonic’s factory using the same components as Panasonic’s own cameras. The Panasonic LX100 and Leica D-Lux (Typ 109) are prime examples. The Q (Typ 116), however, is made in one of Leica’s German factories and although it has traditional controls and looks like a slightly miniaturised M, it has a few modern features like touch-screen control, autofocusing and an electronic viewfinder (EVF). As mentioned earlier, the camera is based around a full-frame (24 x 36mm) CMOS sensor with 24.2 million effective pixels. There’s also a Leica Maestro II processing engine that has been specially adapted for use in the Q and a Leica Summilux 28 mm f/1.7 ASPH lens, which makes a good ‘walkabout’ lens with plenty of scope for restricting depth of field. Although this is a fixed focal length lens there are digital zoom settings equivalent to 35mm and 50mm, which reduce image size to 15.4 and 7.5Mp respectively. Sensitivity may be set from ISO 100 to 50,000, with an automatic setting to put the camera in control and there’s a maximum continuous shooting rate of up to 10fps (frames per second) at full resolution. Leica M cameras are manual focus only, but Leica claims that the Q has the fastest autofocus system in its class – so faster than the Sony RX1. There’s also a Macro setting to reduce the minimum focus distance from 30cm to 17cm. Manual focusing is also possible using the dedicated lens ring. Image may be composed and reviewed on either the 3-inch 1,040,000-dot touch-screen or the 3,680,000-dot electronic viewfinder (EVF). This gives the Q a significant advantage over the Sony RX1 and RX1R as they don’t have viewfinders. When the digital zoom is used, the smaller frame is shown in the viewfinder, but the scene is still displayed in the surrounding area and raw files contain the information for the entire 28mm field. Other modern features of the Q include the ability to record MP4 Full-HD video at 30 or 60fps with stereo sound via the built-in mic, optical image stabilisation for still and video and both Wi-Fi and NFC (near Field Communication) connectivity to allow remote control by a smartphone or tablet as well as image sharing using Leica’s free Q app. 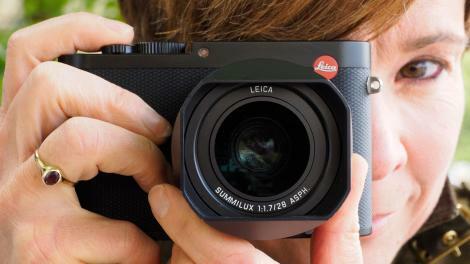 In looks the Q fits right in with Leica’s interchangeable lens rangefinder cameras. Its flat front and rear, straight top and bottom edges and rounded sides mirror those of the M series. The build also feels very similar and the new camera has a top plate of machined aluminium and a body made from magnesium alloy with laser engraved markings. Every photographer I’ve shown it to has been impressed by its looks and build. At 130 x 80 x 93mm the Q isn’t huge, but although it’s slimmer and narrower than the Leica M-P Typ 240 it’s slightly taller. It lacks the impressively compact build of the Sony RX1 (113.3 x 65.4 x 69.6mm) and at 640g with the battery installed it also weighs around 150g more – but the RX1 doesn’t have a viewfinder built-in. As is typical with Leica cameras, the front of the Q is flat with no contours to create a grip, but the subtly textured coating gives a little purchase. On the back there’s a small indentation that makes a natural resting place for your thumb, however this isn’t a camera that you want to carry far without a strap. I found the Peak Design Cuff a good combination as it kept the camera safe on my wrist without the bulk of a neck or shoulder strap. Leica offers an optional grip for additional expense. Exposure may be set using traditional controls – more on these later – but there’s also a full automatic option and 11 automatic scene modes including Sport, Portrait, Landscape, Digiscoping, Miniature Effect and Panorama and Time Lapse available via the Scene mode option in the second page of the menu. With the exception of Time Lapse mode, when these options are selected the settings on the traditional controls are overridden. When PASM is selected in Scene Mode on the menu, exposure is set via the shutter speed dial on the top-plate and the aperture ring on the lens. The shutter speed dial has settings running from 1+ to 1/2000sec in whole stops and the top-plate dial above the thumbrest, which is also used to set exposure compensation, is used to set intermediate settings. Meanwhile the aperture ring can be adjusted in 1/3 stops from f/1.7 to f/16. When +1 is selected on the shutter speed dial, the top-plate dial is used to set shutter speed from 1 second to 30 seconds and exposure compensation must be set via the menu unless the Fn button is set to access it. Both the aperture ring and shutter speed dial have ‘A’ for automatic settings to allow the Q to be set to program, aperture priority or shutter priority mode as well as manual. As there’s a dedicated button for accessing sensitivity on the back of the camera, I used the customisable Fn button to access the white balance options. Both of the dials on the top of the camera are made from metal and consequently feel very durable, but there’s a rather tinny sound when the thumbdial is rotated to adjust exposure compensation. There are three rings around the lens; the aperture ring already mentioned is towards the front element, and the one closest to the camera body is used to switch from normal to macro focusing. As this rotates an alternative focus scale reveals itself. The ring rotates smoothly, but it could do with wider ridged areas to make it easier to grasp. The final ring on the lens sit between the other two and is used for manual focusing. It took me a few moments to work how to get this to rotate, but it’s rather ingenious. There a focus lever (for want of a better word) at the 7 O’clock position as you look at the camera from the front and this has a small button that when depressed releases the ring from its locked position and sets the camera to manual focus. Once in use the manual focus ring moves smoothly and is a pleasure to use. There are also three manual focus assist options; auto magnification, focus peaking and auto magnification and focus peaking. I found the focusing peaking quite variable as it sometimes didn’t pick up high contrast edges, but the screen is clear enough to make the magnified option sufficient to ensure focus is in the right place. To switch from manual focus to autofocus, the previously mentioned button on the manual focus ring must be depressed to allow the focus ring to be rotated beyond the infinity point to the AF setting. There several modes available via the menu for setting AF point: Multi point, 1 Point, Tracking, Face Detection, Touch AF and Touch AF and Release (often known as touch shutter). Of these, I found Touch AF and Multiple point the most useful. In Touch AF the desired AF point is set with a tap of the finger on the screen, while in Multi point mode the point is set directly via the navigation controller on the back of the camera. The screen and controller both respond quickly. Sensitivity and the option accessed via the Fn button (white balance with my set-up) can be adjusted using touch-control, but the main menu of the Q cannot be navigated, nor settings selected using touch-control. It’s not a major issue, but Leica doesn’t appear to make a great deal of use of the touch-screen’s capability in shooting mode. While the rear screen provides a good view of the scene, the electronic viewfinder (EVF) is a better option in very bright conditions and it seems a more natural choice with the Q. This is a pretty high quality unit, but it’s a bit smaller than the EVFs in some compact system cameras and you need to position your eye carefully to get the full view. Left eye users will find they often need to cup their hand around the eyepiece to block out some of the ambient light and get a good view. This is less of an issue for the right-eyed because the bridge of your nose does the job. Pressing the shutter release half way closes down the lens aperture, revealing the depth of field and image as it will be captured, with a fairly good match for the JPEG file. While the electronic level that can be made visible in the viewfinder and LCD is very useful, it’s frustrating that it disappears when the shutter button is pressed to focus the lens. The first thing that strikes you about images captured with the Q is just how much detail they contain. It out-resolves the RX1R at every sensitivity setting and maintains an impressively high level of detail even at the uppermost sensitivity values. The sensor is clearly a high performer and the processing engine handles the files well. At the highest sensitivity values there’s no sign of banding, clumping or smoothing and noise is fine grained. Even very fine details stand close scrutiny at 100% or more on-screen. It’s the visibility of the noise that limits the size at which images can be displayed and this is something that varies depending upon the subject and personal preferences. Few people, however, will find the images that the Q produces at ISO 3,200 and 6,400 objectionable. They have lot of detail and just a little noise visible in even-toned darker areas. Stepping up to ISO 12,500 sees an increase in chroma noise (coloured speckling) but without any noise reduction applied, images can still look good at A4 (11.7 x 8.3inches) or A3 (16.5 x 11.7inches) size. As well as seeing an increase in noise levels at ISO 25,000 and 50,000, there’s a noticeable drop in the colour saturation of JPEG files. Because the noise is evenly distributed and without a regular pattern, the files are ripe for creating atmospheric monochrome conversions. While the Q’s general purpose Multi-field metering does a good job in average lighting conditions, I found that I made quite a bit of use of the exposure compensation dial. In some cases this was to lighten dark scenes, but more often it was to protect the highlights of a bright sky. This is especially important if you’re only shooting JPEGs as they have quite restricted dynamic range. The raw files cope rather better with capturing a wide tonal range and can therefore withstand greater post-capture adjustment. I suspect that most who invest in the Q are likely to understand the benefit of raw files, but there may be some with pots of cash who just appreciate the Leica legacy or the Q’s build quality and want to learn about photography. In natural light the Q’s automatic white balance system copes well with most conditions and is a good option, as is the Daylight setting. Colours are also good. While the Q’s Tracking AF mode does a pretty good job of following a moving subject around the frame and adjusting focus as its distance from the camera changes, it is unlikely that I would use it to shoot sport or action. Similarly in 1-Point mode the camera adjusts focus quickly in good light, but the focal length of the lens makes it a very unlikely choice for sport. This speed could prove useful for street photography, which is a much more likely use of the Q. At the time of writing I’m not aware of the compensation that Leica claims for the Q’s image stabilisation system, but I am able to get consistently sharp images at 1/10sec, with shots look razor sharp at 100%. I was even able to get the odd acceptably sharp image at 0.5sec. Leica has a fantastic reputation for the optical quality of its lenses and the Summilux lens on the Q maintains the tradition. If there is distortion, I can’t see it, as straight lines look to be straight. Flare is also controlled incredibly well and even shots that include the low sun shining directly into the lens look good – there are a few hot spots and a slight lowering of contrast in some areas, but there are no wild colours and it’s possible to produce some very attractive results. With a maximum aperture of f/1.7, some vignetting isn’t really a surprise when shooting wide open, but it’s not dramatic and is often likely to go unnoticed. If you choose to photograph a blank white wall, however you’re likely to see some corner shading even when the aperture is closed down as far as f/8 or smaller, but in more normal photography it is subtle and likely to enhance the image rather than degrade it. As a compact camera with a 24Mp full-frame sensor and a fixed 28mm f/1.7 lens, the Leica Q is in a very limited field. Its closest competition comes from the Sony RX1 and RX1R. Both of these cameras have the same pixel count, but their lens is a 35mm f/2.0, not quite so wide or bright as the Q’s. Unlike the Q, neither of these cameras have a viewfinder built-in either. Leica doesn’t make cheap cameras, and while the Q is certainly expensive, its price doesn’t compare too badly with the Sony RX1 and RX1R – especially when you keep the differences in mind. With automatic scene modes that override the settings on the aperture ring and shutter speed dial, the Q’s traditional appearance and build belies its mainstream functionality. This is a camera that could be used by inexperienced photographers, but it holds most appeal for experienced shooters who appreciate traditional controls, the benefits of a full-frame sensor and Leica’s optical knowhow. Some may struggle to come to terms with Leica’s decision to give the Q an electronic viewfinder (EVF) rather than an optical one, but unlike Leica’s M cameras, the Q isn’t a rangefinder model and it has automatic focusing. The Q looks and feels superb, with carefully crafted lines and a solid feel. It’s not the most comfortable camera to hold or use, but it’s not the worst either and the indent for your thumb on the back and the textured coating on the front do just enough to keep it steady in your grasp. Traditional controls make setting aperture and shutter speed quick and easy, plus you can check them with a glance without even turning the camera on. In addition, the Q has a fast and accurate autofocus system with a macro setting that brings the closest focusing distance to just 17cm. With a full-frame sensor and a maximum aperture of f/1.7 it’s possible to restrict depth of field dramatically to focus attention on your subject produce attractively blurred backgrounds. Most importantly, the Q is capable of capturing very high quality images that have superb levels of sharp detail and good colours. Generally speaking the Q is a real pleasure to use, but there are a few little niggles worth mentioning largely because of the cost involved. The exposure compensation dial sounds rather tinny in action, for example, and the macro focus ring and manual focus release button on the lens are both rather fiddly to use. It would also be nice if greater use was made of the touch-screen’s capabilities and for the electronic level to carry on operating when the shutter release is depressed. I’d like a bit more of a grip on the front of the camera, but that would be a departure from Leica’s M-like styling and there is an optional grip available. As a full-frame camera the Q isn’t small, but it lacks the bulk of full-frame DSLRs like the Canon 5DS or 5D Mark III. Anyone searching for a pocketable compact camera needs to look elsewhere. Although it has automated shooting options that suit novice photographers, the Leica Q is a serious camera for a serious price. It may lack some of the features of modern compact cameras, such as a host of filter effects and dynamic range optimisation options, but the Q isn’t necessarily worse for that. It means the menu is relatively short, so you can find what you’re looking for quickly and it’s easier to focus on the more important aspects of photography. Leica has also managed to combine its traditional styling with modern features such as an electronic viewfinder and a live view enabled touch screen in a camera that’s capable of producing superb quality images. The Q is a beautiful camera that hints at the future for Leica.